This software permits to train children's attention and concentration skills. After starting the game, children must look at the number hidden among the balls, then the cannon must be charged using the number which makes 10 if added to the number seen before among the balls. After charging the cannon, children must put the mouse on the number moving among the balls and then click. 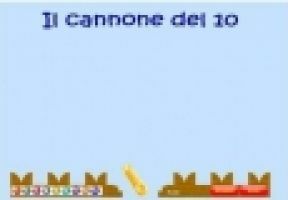 If the two numbers together make 10, the cannon will shot giving 10 points to the player; if it is wrong, an empty ball will appear on the screen trying to irritate the player. Twenty little squares between two blackbirds mark time. When time is over, if the player made some mistakes, a number of points will be taken off.